Website blocking is the most necessary and important function for both parental control and employee monitoring software. There are two ways blocking unwanted content - to block all websites except trusted with a whitelist or to block specify sites with a blacklist. 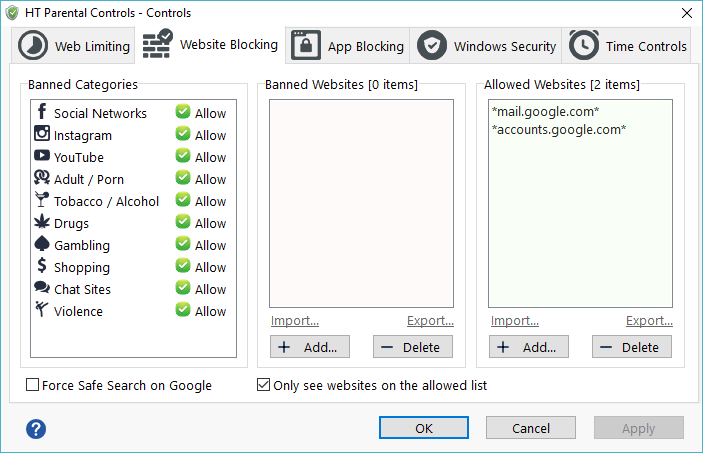 Whitelist allows you to automatically block all websites that are not on your list of allowed websites. That requires preparation at the beginning to prepare the whitelist, but guarantees maximum protection and reduces your risks to a minimum. Whitelist mode is ideal for children under 10-11 years. Blacklist, on the contrary, blocks websites specified on the list and allows all others. This way of filtering content is more suitable for older children, whose parents want to protect their children without giving them the feeling that they are over-controlled. On the Controls menu, click Website Blocking. Click the Add button under the Allowed Websites list. Enter a website address or a keyword you want to allow. For example wikipedia.org or wikipedia. Enter all the websites you want to allow. Select the Only see websites on the allowed list checkbox. Website address on your list must be equal to their real address on the Internet. The most reliable way is to open a website on your browser and copy-paste its URL to the program. Do not include in your list of sites additional characters. Avoid slashes, www and other symbols that the real website URL does not contain. For example, to allow Gmail, you need to add to the list mail.google.com and accounts.google.com to log in, but not gmail.com. Since gmail.com is not a real URL for this site. Importing/exporting allows you to transfer your lists to a new computer / OS or configure the software on a few commuters more easily. 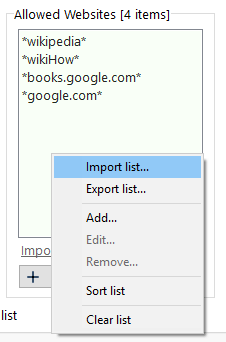 Right-click on the Allowed Websites filed and select Import List.. Choose your file with websites in a txt or csv format. Now the software will block all websites and allow only websites specified on the Whitelist. You can use the Allowed Websites list in two different modes depending on the Only see websites on the allowed list check box. If the check box is selected, Allowed Websites works as the white list to block all websites except a few. 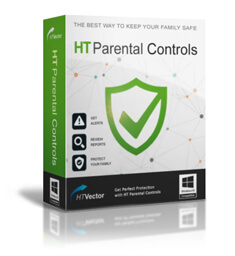 HT Employee Monitor and HT Parental Controls allow switching between Whitelist and Blacklist modes, so you can either block all websites except a few or block only certain websites. 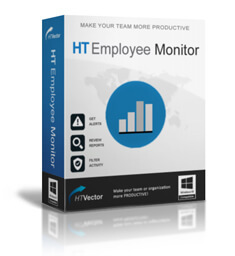 It is compatible with all versions of Windows and has several levels of protection. Password protection is also available. 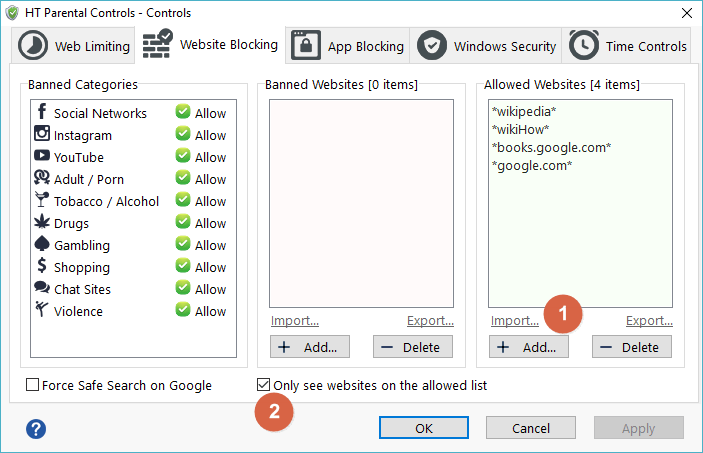 Block all websites except whitelisted in all common browsers - Google Chrome, Internet Explorer, Microsoft Edge, Firefox, etc. Record computer activities - visited websites, launched programs, computer activities, etc. Test the program yourself to be sure that our Whitelist perfectly handles the task and that your users cannot bypass it. Please test all program features with 15-day free trial versions.